May 28, 2014 Press Release - Survey Says... School Gardens Thriving in California – Results from the California School Garden Survey. Life Lab, in collaboration with the California School Garden Network, conducted the California School Garden Survey to gain insights into the factors that help school gardens to function effectively, the resources that are needed to sustain them, and how they are utilized. 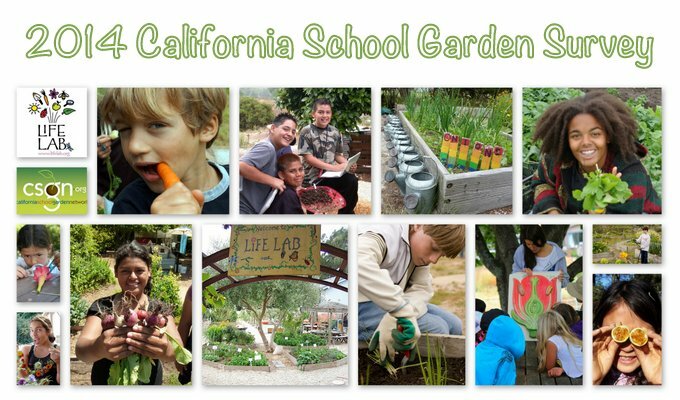 The 2014 California School Garden Survey received 552 completed responses from schools across the state of California, an increase from 496 completed responses received for the 2011 California School Garden Survey, which was also conducted by Life Lab. On the 2014 survey, 86% of respondents had school garden programs, while 14% did not have school gardens. In comparison, on the 2012 survey, 91% of respondents had school gardens, while 9% of respondents did not have school gardens. View all survey questions in a Word document. The vast majority of survey respondents were teachers. The survey found that of the schools that reported having gardens, 77% were schools in urban or suburban neighborhoods, and 91% of the schools were classified as public schools. In addition, the majority of schools responding to the survey reported serving Kindergarten through 5th grade. The majority of school gardens were started 5-10 years ago. Notably, 10.5% of the school gardens responding to the survey were started within the last year. Many of the school gardens surveyed reported growing a wide variety of plants including vegetables, herbs, fruits (trees or vines), ornamentals (such as flowers), nuts, California native plants and wildlife habitat. Of these, vegetables and herbs were found to be the most commonly grown plants. Respondents also reported growing a variety of theme gardens including three sisters gardens, pollinator gardens, butterfly gardens, and beds with culinary themes such as: pizza, soup, salsa, salad and stir-fry. On the survey, 85% percent of respondents reported that edible plants are harvested for consumption and eaten during garden time. In addition, 61% stated that the edible plants are used for academic study, and 43% indicated that produce is used in tasting programs such as Harvest of the Month or cafeteria tasting. The majority of respondents, 88%, reported that the garden is used during class instruction time, while 50% of respondents also stated that the garden is used after school. In addition, respondents reported that Kindergarten through 5th grade students most often participate in garden programing. The 2014 California School Garden Survey found that teachers most often teach students in the garden. 65% of respondents reported that the school garden is used for core academic content instruction. Within the areas of core academic content instruction, 75% of respondents reported using the garden to teach Math and English/Language Arts, while 54% reported using the garden to teach History/Social Sciences. Most significantly, 99.7% of respondents indicated that they use the garden to teach science. The survey also found that a number of non-core subjects are also taught using the garden. The top three non-core subjects most commonly taught using the garden were nutrition/health, environmental studies and art. The survey reported that 81% of respondents observed increased environmental attitudes in their school garden participants, while 67.3% reported observing improvments in health and nutrition. The California School Garden Survey asked a number of questions regarding linking school gardens to Farm to School programing. Farm to School programs connect schools with local farms with the objectives of serving healthy meals in school cafeterias, improving student nutrition, providing health and nutrition education, and supporting California’s farmers. The majority of survey respondents reported that they do not define their garden as part of Farm to School programing. 22.6% of respondents indicated that their cafeterias source local produce from farmers, while 28.7% reported that their school aligns garden education with marketing/promoting fruits and vegetables in the cafeteria. The survey found that the top three factors/resources that would best support academic instruction in the garden are teacher training in garden-based learning instruction (65%), access to garden-based curriculum/education materials (45.8%), and lesson planning time (37.6%). In addition, 51.5% of respondents indicated that their staff has received no garden-based professional development in the past three years. Respondents indicated that the professional development topics that they would attend or like to see offered in their area are "Connecting the garden to Common Core English/Language Arts and Math" (66%), "Connecting the garden to Next Generation Science Standards" (62%), and "Garden enhanced nutrition education" (53.4%). In terms of support organizations, the majority of respondents (40.5%) indicated that non-profit support organizations have collaborated with their school garden during the last academic year. The survey also found that teachers do the most on-going garden site maintinence (i.e. caring for plants, watering, repairs), and take the most responsibility of management of the garden (i.e. fundraising, planning, coordination). In addition, 61.4% of respondents cited that there are no paid staff that manage the garden or teach in the garden outside of classroom teachers. The majority of respondents indicated that volunteers spend 0-3 hours on average per week in the garden. Lastly, the survey found that responsibility for summer maintinence of the garden is most often taken on by parent volunteers (40.7%) and teachers (31.9%). In terms of school garden budgets, the survey found that total school garden budgets most often range between $0 and $499. During the last academic year, 49.8% of respondents indicated that their school garden has received funds from grants and/or foundations. School gardeners indicated that the three elements that would most benefit their school garden program overall are funding (62.7%), a garden coordinator staff position (39.9%), and time scheduled within the school day for garden instruction (34.2%). Respondents were also asked hypothetically, if their school garden was granted $10,000 for the next year, what are the top two things that they would they spend that money on? The physical site was reported to take top priority, with 74.3% of respondents indicating that they would spend the money on improving or adding features within the garden (such as gathering areas, plants, hardscape, irrigation, signage, kitchen, raised beds, garden tools, compost materials, etc.) The second priority was paid staff, for which 46.8% of respondents said that they would alot some (or all) of the money to hiring paid garden staff. The California School Garden Survey also included questions for respondents who do not have school gardens. When asked to indicate the reasons that best describe why their school does not have a garden program, the majority of respondents, 69.1%, cited lack of funding as a reason for not having a school garden. In addition, 49.4% of respondents cited lack of staffing and lack of garden supplies as other reasons why their school is not able to have a garden program. Encouragingly, 81.3% of the schools that reported not having garden programs indicated that their school does have ambitions or plans for building a garden in the future. Life Lab would like to thank the 552 survey respondents that took the time to complete the 2013-2014 California School Garden Survey.